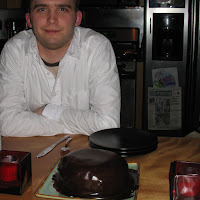 My first introduction to Sachertorte was at the Window Shop* in Cambridge, MA. Many years later Ed and I visited Christopher at his loft in Brooklyn and I found I was to be treated to this awesome desert again. Not only treated to the finished product but also the opportunity of seeing Christopher create this dessert from scratch. As Ed and I watched, Christopher chopped the chocolate with errant bits flying all over his kitchen. We watched as he prepared the torte and apricot glaze and as he nervously prepared the chocolate glaze anxious that it would be just the right consistency (it was). The resultant torte, served with unsweetened whipped cream (along with an introduction to a whipped cream maker)** more than lived up to my expectations. Recently I asked Christopher to share this recipe and he obliged by sending me several pages scanned from Kaffeehaus: Exquisite Desserts from the Classic Cafes of Vienna, Budapest and Prague by Rick Rodgers. I have taken the liberty of quoting the entire Sachertorte recipe well as some of the interesting history and commentary found in Kaffeehaus. I suggest those who love to make (or even just eat) Viennese pastry check out this history in its entirety as well as other recipes and commentary this book. "The prince wanted to make a splash, so he instructed the chef to come up with the opposite of the light, fluffy, creamy 'feminine' Torten popular at the time, and to surprise his guests with a dryer, more compact 'masculine' cake. The chef never was able to fulfill the prince's request, because he fell ill. The kitchen's sixteen-year-old second apprentice, Franz Sacher, would have to take over in the masters absence. Chocolate, one of the most aggressive and 'masculine' flavors in the kitchen, would be his cake's motif, tempered by the tart tang of apricot preserves. (More than one hundred years later, just where young Sacher spread the preserves on the cake would become the crux of the argument between the two master bakeries.) The recipe for the chocolate cake layer was nothing new, but the glossy chocolate topping was a true innovation." " So now the capitalized 'Sacher Torte' means the certified cake, sold only by the hotel's bakery, where as a 'Sachertorte' indicates a cake made in the Sacher style." alleged recipe did leak, however, when some former employees of the hotel printed it in the lean post-war years. Now many different incarnations of the Sachertorte exist, and most of them are excellent. all), many of them are victims of faulty translation from German to English and metric to volume measurements. To mention just two examples I discovered in my latest research: The 'original' recipe calls for 110 grams of confectioners' sugar, which weighs 4 ounces and measures 1 cup by volume. It also calls for 110 grams granulalted sugar, which may weigh the same 4 ounces, but measures only about 1/2 cup by volume. Many translations mistakenly convert this to 1 cup. This mistake makes a very heavy cake. Also, some versions call for 'kneading' the 'dough,' a glaring mistranslation for 'stirring the batter,' and call for keeping the oven door propped open with a wooden spoon - an obvious throwback to the days when wood-burning ovens, which run hot, were used to bake the cake." Sacher and Demel are required pilgrimages for the serious dessert lover. You must taste both and make your own choice. You may not agree with the court, but it will be heavenly trying to decide." What a job Rogers had doing research for his book! This version is based on the recipe in Das Grofse Sacher Bachbuch ('The Big Sacher Baking Book') which should be a reliable Source [Roger's note]. holes in the top of the cake, if that happens take some cake trimmings and mash them with a little of the apricot glaze to make at paste, and use a metal icing spatula to 'spackle' the holes with the mixture . 1. To make the torte: Position a rack in the center of the oven and heat to 400 degrees F. Lightly butter a 9-inch springform pan and line the bottom with a round of parchment or wax paper [I believe Christopher also butters the top of the wax paper]. Dust the sides of the pan with flour and tap out the excess. sugar. Return the speed to medium-high and beat until light in color and texture, about 2 minutes. Beat in the egg yolks, one at a time, scraping down the sides of bowl. Beat in the chocolate and vanilla. with a large balloon whisk or rubber spatula. Repeat with the remaining flour. 6. To assemble: Using a long serrated knife, trim the top of the cake to make it level. Cut the cake horizontally into two equal layers. Place one cake layer on an 8-inch cardboard round. Brush the top of the cake layer with the apricot glaze. Place the second cake layer on top and brush again. Brush the top and sides of the cake with the remaining glaze. Transfer the cake to a wire rack placed over a jelly-roll pan lined with wax paper. Let cool until the glaze is set. 7. Make the chocolate glaze (it must be freshly made and warm). Pour all of the warm chocolate glaze on top of the cake. Using a metal offset spatula gently smouth the glaze over the cake, allowing it to run down the sides, being sure that the glaze completely coats the cake (patch any bare spots with the spatula and the icing that has dripped). Cool until the glaze is barely set, then transfer the cake to a serving plate. Refrigerate until the glaze is completely set, at least 1 hour. Remove the cake from thc refrigerator about an hour before serving. in contact with moist fillings, and provide a slick undercoat that adds an extra sheen when another glaze is poured over the dessert. Apricot and red currant are the most versatile, as their acidity balances fhe sweetness of the dessert, but you can use another favorite flavor, if you wish. Just be sure to use preserves, and not jam or jelly, which have different fruit - sugar ratios. The preserves must be simmered for a few minutes to evaporate excess liquid and give a firm, thick finish to the glazed desserts. It's best to turn an entire 12-ounce jar of preserves into glaze, storing the glaze in the empty preserves jar so you have small amounts ready when needed. Bring the preserves and [water or] rum to a boil in a small saucepan over medium heat, stirring often. hard on the solids. Use warm. Substitute red currant preserves for the apricot preserves. This ebony-dark, shiny, intensely sweet chocolate glaze was originally invented to coat Sachertorte, but it's a great icing to use for many other baked goods. The authentic icing must be cooked into syrup that hardens to a fudge-like consistency (some bakers also temper the syrup, a difficult optional step). Schokoladeeglasur stays glossy at any temperature, as long as the cake has an undercoat of preserves, Be sure to allow the undercoat to cool and set before applying the chocolate glaze, and use the chocolate glaze immediately after making it, while it is still warm and fluid. too rapidly and burn before it reaches the correct temperature) over high [medium-high? - see below] heat, bring the sugar, water, and chocolate to a boil over medium-high heat, stirring occasionally. Attach a candy thermometer to the pan. Reduce the heat to medium and cook, uncovered, stirring, until the mixture reaches 234 degrees F., about 5 minutes. 2. Remove from the heat and stir to cool and thicken slightly. about 1 minute. Use immediately. When pouring, do not scrape the pan." While writing about Viennese pastry I cannot help but recall the Window Shop, later The Blacksmith House in Cambridge, MA. When Ed and I were living in Cambridge it was our source for birthday cakes, usually a Wiener Torte, one of the "light, fluffy, creamy "feminine" Torten" referred to above. Their awesome repertoire included the Wiener Torte, Sachertorte, Mozart Torte, Linzertorte and Apple Torte. The Linzertorte, though always made by me, never the Window Shop, has long been Christopher's birthday cake of choice. I have dresses in my closet from the Window Shop and Ed and I celebrated his successful defense of his doctoral theses with dinner there. We celebrated Alexandra's arrival with a real birthday Weiner Torte from the Blacksmith House Bakery. April 1, 2013: A very special surprise! Chris came for dinner tonight, and after dinner, which Ed cooked, Chris presented me with an awesome Sachertort, which he had made, along with a "Happy Birthday" solo. The glaze is tricky and even Chris admitted that this time he really nailed it (reflections in the photo distort the smoothness of the glaze --- but this was a celebration not a photo-shoot). In addition Chris used Valrhona Noire Orange Chocolate ( from Whole Foods) for the glaze and raspberry as well as apricot preserves for the filling. The orange and raspberry additions made this cake extra special. Absolute perfection! April 2015: What an awesome glaze (and son)! ** April 2017: Chris has come full circle on the whipped cream. Perhaps, based on the whipped cream Bonnie's uses on Apple Strudel, he now favors whipped cream made with an electric mixer, and for my recent birthday, served slightly sweetned whipped cream prepared with a mixer along with the awesome cake.